Liverpool FC has today announced the launch of a new International Academy in Hong Kong. Together with partner PNH Soccer Academy Ltd, the Reds will now deliver ongoing coaching programmes to youngsters at multiple venues across Hong Kong. 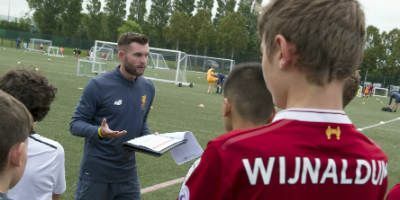 The youth coaching will provide unique opportunities for children aged three to 17, from grass roots level through to teams that compete in local leagues and tournaments, to learn to play ‘The Liverpool Way’. Age-specific coaching sessions will help players improve their football and social skills and develop their technical, tactical, physical and social abilities. A wide range of year-round programmes are planned, including ongoing player development sessions, soccer schools in the holiday season and an annual youth football tournament. Through the unique coaching methods of Liverpool FC, there will also be a focus on improving key life skills of the young participants, such as communication, teamwork, confidence, preparation and organisation. The implementation and development of the coaching programme will be overseen by an LFC coach, who will be based in Hong Kong to head up the project. Local coaches will also be involved and will benefit from a comprehensive coach education scheme, which will include the LFC International Academy global accreditation, to deliver coaching ‘The Liverpool Way’. Reds legend and LFC International Academy ambassador Ian Rush said: “Our International Academies are a fantastic opportunity to bring authentic LFC coaching to children and young people around the world. "This project will provide many opportunities for young players to improve a broad range of skills such as teamwork and communication. Perhson Wong, chairman of PNH Soccer Academy Ltd, said: “We are excited with the opportunity to work alongside a prestigious football club with such a strong heritage. It is a great opportunity for us to offer a unique coaching system that brings the best of both local culture and international standards to our young players. “We believe every child is unique and has the potential to grow as a strong, influential individual. This all starts with education and professional training. "We are confident with a good team of professionals, we can build a leading soccer academy ‘The Liverpool Way’, coaching both football skills and instilling the LFC mentality in the next generation. To officially launch the start of the programme in Hong Kong, over 500 local children aged between four and 12 will take part in a three-a-side tournament that will span across three days at Olympian City, Kowloon. Due to kick off on Saturday June 30 at 11am (HKT), a total of 60 teams will take part in the competition, playing against each other to be crowned the overall champions of their age group. The pop-up event will see LFC Legend Vladimir Smicer overseeing the tournament and coaching of players, while taking part in a signing session with fans.